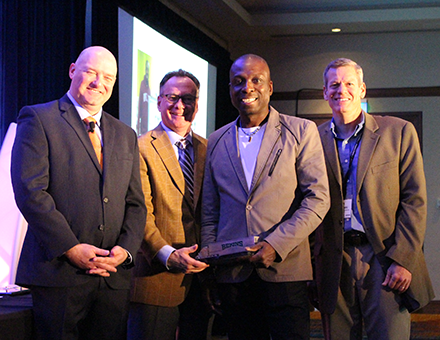 INDIANAPOLIS – Announced recently at its 63rd Annual Partnership Conference, five drivers were awarded top honors as Wheaton World Wide Moving 2017 Drivers of the Year. These awards are given to individuals who earned the Driver of the Month award from September 2016 through August 2017 and who consistently provide superior service to Wheaton customers. By their excellent records in claims, customer service and safety, these drivers are among the best in the van lines’ fleet. Direct Lease Driver of the Month for May 2017, Delroy Robinson of Waterbury, Conn. (pictured above), has 16 years of experience as a household goods driver. He maintains a top driver performance rating and has won three Driver of the Month awards. From left: Executive VP A.J. 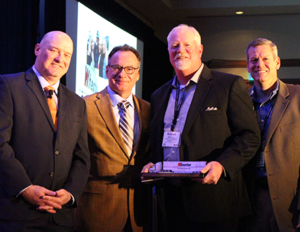 Schneider, CEO Mark Kirschner, Permanent Fleet Driver of the Year Bob Stenborg, and VP of Operations Ron Borkowski. Robert Stenborg, Coast Valley Moving & Storage, Inc., San Clement, Calif., earned Wheaton’s Permanent Fleet Driver of the Month award in December 2016. Robert has more than 16 years of experience as a professional mover and has been Driver of the Month twice. Edward Sopko, Olympia Moving & Storage, Inc., Alexandria, Va., earned Wheaton’s Intermittent Fleet Driver of the Month award in November 2016. Ed maintains an excellent performance rating and has more than 35 years of experience as a professional mover. 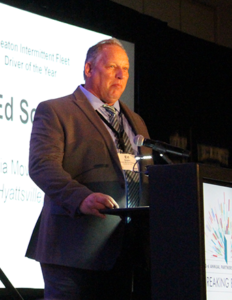 Ed Sopko accepts the award for Intermittent Fleet Driver of the Year.